NASA:Neil Armstrong, as photographed by Buzz Aldrin, working near the Eagle lunar module after the landing on July 20, 1969. Neil Armstrong, who made the “giant leap for mankind” as the first human to set foot on the moon, died on Saturday. He was 82. His family said in a statement that the cause was “complications resulting from cardiovascular procedures.” He had undergone heart bypass surgery this month in Cincinnati, near where he lived. His recovery had been going well, according to those who spoke with him after the surgery, and his death came as a surprise to many close to him, including his fellow Apollo astronauts. The family did not say where he died. A quiet, private man, at heart an engineer and crack test pilot, Mr. Armstrong made history on July 20, 1969, as the commander of the Apollo 11 spacecraft on the mission that culminated the Soviet-American space race in the 1960s. President John F. Kennedy had committed the nation “to achieving the goal, before the decade is out, of landing a man on the Moon and returning him safely to Earth.” It was done with more than five months to spare. On that day, Mr. Armstrong and his co-pilot, Col. Edwin E. Aldrin Jr., known as Buzz, steered their lunar landing craft, Eagle, to a level, rock-strewn plain near the southwestern shore of the Sea of Tranquillity. It was touch and go the last minute or two, with computer alarms sounding and fuel running low. But they made it. The same could have been said for hundreds of millions of people around the world watching on television. Soon Colonel Aldrin joined Mr. Armstrong, bounding like kangaroos in the low lunar gravity, one sixth that of Earth’s, while the command ship pilot, Michael Collins, remained in orbit about 60 miles overhead, waiting their return. In all, 12 American astronauts walked on the moon between then and the Apollo 17 mission in 1972. The Apollo 11 mission capped a tumultuous and consequential decade. The ’60s in America had started with such promise, with the election of a youthful president, mixed with the ever-present anxieties of the cold war. Then it touched greatness in the civil rights movement, only to implode in the years of assassinations and burning city streets and campus riots. But before it ended, human beings had reached that longtime symbol of the unreachable. 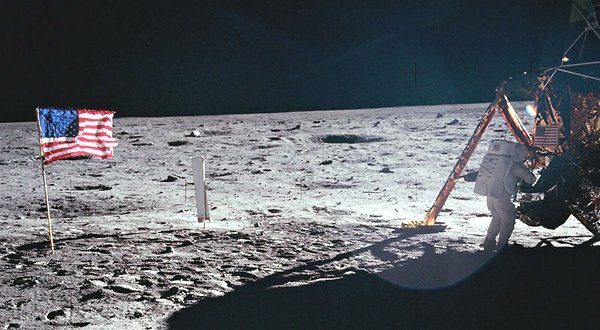 The moonwalk lasted 2 hours and 19 minutes, long enough to let the astronauts test their footing in the fine and powdery surface — Mr. Armstrong noted that his boot print was less than an inch deep — and set up a television camera and scientific instruments and collect rock samples. Indeed, some space officials have cited these characteristics, as well as his engineering skills and experience piloting X-15 rocket planes, as reasons that Mr. Armstrong stood out in the astronaut corps. After the post-flight parades and a world tour for the three Apollo 11 astronauts, Mr. Armstrong gradually withdrew from the public eye. He was not reclusive, but as much as possible he sought to lead a private life, first as an associate administrator in the space program, then as a university professor and director of a number of corporations. Neil Alden Armstrong was born on Aug. 5, 1930, in the small town of Wapakoneta, Ohio, to Stephen Armstrong and the former Viola Louise Engel. His father was a state auditor, which meant the family moved every few years to a new Ohio town while Neil was growing up. At the age of 6, Neil and his father took a ride in a Ford Trimotor airplane, known as the Tin Goose. It must have made an impression, for by the time he was 15, he had learned to fly, even before he got his driver’s license. Neil became an Eagle Scout when the family later moved back to Wapakoneta, where he finished high school. (The town now has a museum named for Mr. Armstrong.) From there, he went to Purdue University as an engineering student on a Navy scholarship. His college years were interrupted by the Korean War, in which Mr. Armstrong was a Navy fighter pilot who flew 78 combat missions, one in which he was forced to eject after the plane lost one of its ailerons, the hinged flight-control panels on the wings. In “First Man: The Life of Neil Armstrong,” James R. Hansen wrote that in Mr. Armstrong’s first year at Purdue, Charles E. Yeager broke the sound barrier in the rocket-powered Bell X-1. It was exciting but bittersweet for the young student. He thought aviation history had already passed him by. During the Korean War, Mr. Armstrong was in the unit that the author James A. Michener wrote of in “The Bridges at Toko-Ri.” Back at Purdue after the Navy, Mr. Armstrong plunged more earnestly into aeronautical engineering studies, his grades rising and a career in sight. By this time, he had also met Janet Elizabeth Shearon, a student in home economics from Evanston, Ill. Soon after his graduation, they were married, in January 1956. They had two sons, Eric and Mark, who survive. A daughter, Karen, died of an inoperable brain tumor in 1962. The couple were divorced in 1994; Janet Armstrong lives in Utah. In 1999, Mr. Armstrong married Carol Knight, a widow 15 years his junior; she also survives. They lived in Indian Hill, a suburb of Cincinnati. Other survivors include a stepson and stepdaughter; a brother, Dean; a sister, June Armstrong Hoffman, and 10 grandchildren. After his first marriage, the newlyweds moved to California, where Mr. Armstrong had been hired as an experimental test pilot for the National Advisory Committee on Aeronautics, the forerunner of the National Aeronautics and Space Administration, at Edwards Air Force Base. His first flight in a rocket plane was in the Bell X-1B, a successor to the plane Mr. Yeager had first flown faster than the speed of sound. Mr. Armstrong impressed his peers. Milt Thompson, one of the test pilots, said he was “the most technically capable of the early X-15 pilots.” Another colleague, Bill Dana, said he “had a mind that absorbed things like a sponge and a memory that remembered them like a photograph.” He made seven X-15 flights at 4,000 miles per hour, reaching the edge of space, and piloted many more of the most innovative and dangerous aircraft ever developed. In 1958, Mr. Armstrong was chosen as a consultant for a military space plane project, the X-20 Dyna-Soar, and was later named one of the pilots. But the young test pilot was attracted by another opportunity. NASA was receiving applications for the second group of astronauts, after the Mercury Seven. His reputation after seven years at the NASA flight center at Edwards had preceded him, and so he was tapped for the astronaut corps. “I thought the attractions of being an astronaut were actually, not so much the Moon, but flying in a completely new medium,” Mr. Armstrong told his biographer. At Houston, the new astronaut began training for flights in the two-person Gemini spacecraft, the successor to the smaller Mercury capsules and forerunner to the three-person Apollos. Mr. Armstrong became the first American civilian astronaut to fly in space, as commander of Gemini 8. He and his co-pilot, David R. Scott, were launched on March 16, 1966. They performed the first successful docking of two vehicles in space, their Gemini linking with an unmanned Agena in an essential test for later operations on lunar flights. Once docked, however, the joined spacecraft began to roll. Attempts to steady the vehicle were unavailing. On instructions from Mission Control, Mr. Armstrong separated Gemini from the Agena, but the rolling only increased, to the point that the astronauts were in danger of passing out. The problem was evidently in the Gemini itself. The astronauts turned the control thrusters off, switching to the re-entry control system. Stability was restored, but once the re-entry propulsion was activated, the crew was told to prepare to come home before the end of their only day in orbit. Next, Mr. Armstrong was the backup commander for Apollo 8, the first flight to circumnavigate the Moon, doing so at Christmastime in 1968. It was the mission that put Apollo back on track after a cockpit fire during a launching pad rehearsal had killed three astronauts in January 1967. And it put Mr. Armstrong in position to command Apollo 11. If everything went well with the lunar module test on Apollo 9 and with a shakedown flight to lunar orbit on Apollo 10, then Mr. Armstrong was in line to land on the Moon with Buzz Aldrin and with Michael Collins as the command module pilot. As the commander, NASA officials decided, Mr. Armstrong would be the first to walk on the Moon. About six and a half hours after the landing, Mr. Armstrong opened the hatch of the four-legged lunar module and slowly made his way down the ladder to the lunar surface. A television camera followed his every step for all the world to see. A crater near the landing site is named in Mr. Armstrong’s honor. After leaving the space program, Mr. Armstrong was careful to do nothing to tarnish that image or achievement. Though he traveled and gave speeches — as he did in October 2007, when he dedicated the new Neil Armstrong Hall of Engineering at Purdue — he rarely gave interviews and avoided the spotlight. For a time, he was an associate NASA administrator for aeronautics, but he tired of a Washington desk job. Ignoring many high-level offers in business and academia, he returned to Ohio as a professor of aeronautical engineering at the University of Cincinnati and bought a farm near Lebanon, Ohio. He also served as a director for several corporations. “He remained an advocate of aviation and exploration throughout his life and never lost his boyhood wonder of these pursuits,” his family said in the statement. Mr. Armstrong re-entered the public spotlight a couple of years ago to voice sharp disagreement with President Obama for canceling NASA’s program to send astronauts back to the Moon. Later, he testified to a Senate committee, expressing skepticism that the approach of relying on commercial companies would succeed. Almost as soon as the news of his death was announced, there was an outpouring of well wishes and fond memorials on Web sites and social media, a reflection of the extraordinary public acclaim that came to a very private man. John Schwartz contributed reporting. Susan C. Beachy contributed research.